9' 6" x 12' 7"
Oushak - 9' 6" x 12' 7"
The relationship between Oushak rugs of the later nineteenth and earlier twentieth centuries and "Ushak" carpets of classical Ottoman Turkish type is not often clear since we know little about the intervening production of the later eighteenth and earlier nineteenth centuries. This rare and unusual Oushak carpet, however, adapts the form of a small-scale prayer rug, and in doing so, it discloses its strong local roots. It displays the triple niched design descended from the "coupled column" classical types attributed to Ushak, Ladik, and Ottoman Turkish Transylvania. But this example also has ties to various other types of early Turkish prayer rugs. The thin column pairs have become outlines of single columns with pendant flowers very much like those on Ghiordes prayer rugs, while the vertical spray of flowers running up the center of the field relates to Kula prayer rugs. A particularly early feature is the lovely main border of palmettes reminiscent of the Ushak or Ladik prototypes. 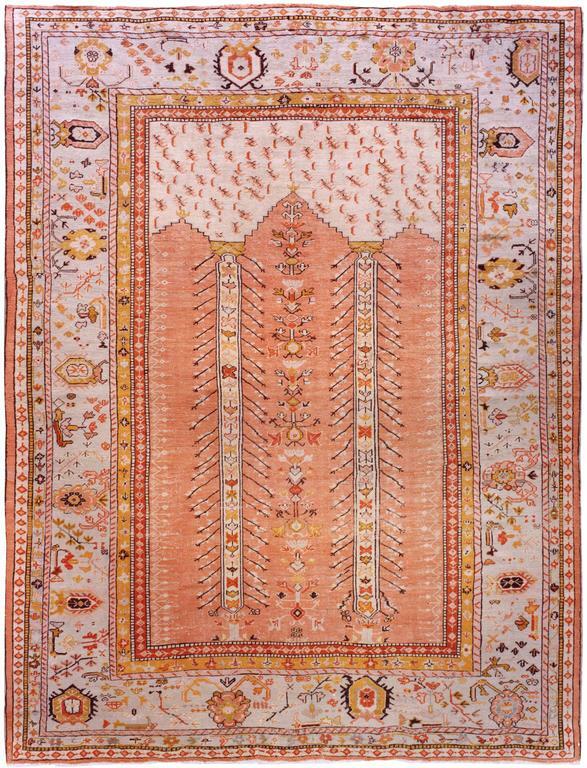 The soft salmon and ivory palette recalls early carpets and prayer rugs from Çannakale near Bergama in Northwest Turkey.